GENUINE MINI WINTER WHEELS AND TYRES. COMPLETE WHEEL SETS FROM £860* RRP. YOU’RE IN SAFE HANDS WITH MINI WINTER TYRES. THE COLD HARD FACTS. You won’t be surprised to hear that driving in winter is a lot more dicey than any other time. The best way to enjoy a safe journey from Autumn to Spring is by using tyres that have been specially developed to cope with the very worst that jack Frost can throw at you. With average British winter temperatures dipping below 7°C, you need to get your skates on and switch to winter tyres with more natural rubber in their compound to give extra grip. Being safe doesn’t mean having to look safe, and the winter wheel and tyre packages come in steel or alloy rim design to compliment your MINI’s good looks. Visually you will only notice a slight difference within the tread compared to summer tyres: Increased number of sipes cut into tread pattern, open tread blocks to dissipate standing water, increased number of tread blocks and winter-optimsed blend of rubber and silca compound. 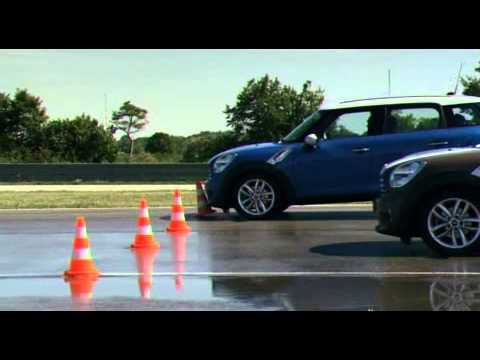 FOR A SAFER DRIVE, SWITCH TO MINI WINTER TYRES THIS WINTER.